A Cambria counter top is a manufactured product combining natural quartz (derived from granite) with a binding, coloring resin. Hence the name... "quartz" countertop. This process forms a tough, low-maintenance, high-performance surface similar to a granite countertop. Cambria countertops offer plenty of design latitude with a broad and evolving color-palette featuring enticing patterns not found with other quartz countertop manufacturers. Slab thickness is either 2cm or 3cm (just like granite) with possible edge size up to 6cm with laminated countertop edges. This range accommodates 14 edge styles including complex, "fancy" edges and those for a thick/heavy slab look. Cambria is a fantastic choice for your kitchen countertops, kitchen island or bathroom vanity. Tile is also available, for walls and showers. 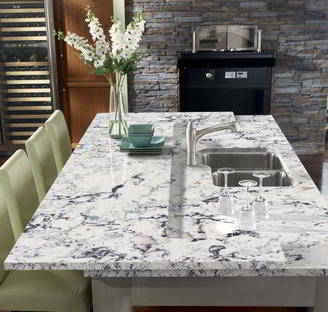 Like all man-made quartz surfaces, Cambria countertops cannot be used outside for an outdoor kitchen. The resin that binds the quartz will yellow with exposure to the sun and UV rays. Quartz countertops are not impervious to damage as many think. Cambria countertop colors now number around 100 available in a broad range from whites to black, blues, browns, greens and most shades in-between. Pattern choices for quartz countertops (whether Silestone, Zodiac, Caesarstone or a Cambria counter top) used to be fairly limited to solid colors or a very uniform speckled pattern. Many appreciated such patterns for the consistency, but many found the lack of movement boring. Cambria has responded to market demands adding natural-looking patterns that more realistically resemble the depth of granite along with sophisticated marble-like patterns. Of course, more natural equals more movement. Movement vs. consistency has always been a matter of personal taste. Of course, the advantage of a consistent Cambria counter top pattern (or granite pattern) is minimizing visibility of seams. Slabs with a consistent pattern can be easily matched up without a shift in the pattern or color at the seams, which is sometimes a concern with granites that have a lot of pattern movement. A good fabricator can match quartz/granite slabs to eliminate a color/pattern shift and an obvious seam, so this has never been much a problem in the industry. Hiding seams is just easier with consistent patterns whether granite or quartz countertops. So, if you are deciding... movement or consistency.... don't let the seam issue bother you too much (whether granite or the new natural Cambria counter top patterns) and just go with what you love. A Cambria counter top (like any quartz countertop) is not heat, scratch or stain-proof. That's important to understand. The fact that you don't have to seal quartz seems to lead many to believe it's impossible to damage. Not true. Certain chemicals (like bleach) and food products such as, wine, vinegar, tea, juice, coffee, soda, some fruits and vegetables can stain or discolor the surface if these substances are not promptly cleaned up. Really, it's not much to worry about. The truth is that such occurrences are rare and mostly on white colors. You'd have to try pretty hard and be very neglectful to do any real damage, but it is possible, so don't let the marketing mislead you. Daily cleaning on quartz countertops is a snap. Hot water and a sponge are sufficient for keeping things tidy. For more thorough cleaning that will leave the surface protected and looking its best use stone cleaner. Cambria countertops are mostly quartz (stone) after-all. Stone cleaners perform far better than generic cleaners, and you'll avoid a potentially permanent chemical stain that can occur with some products on quartz countertops. I like this Granite & Marble Cleaning Spray, which provides excellent results and cheaper than others. Do not use abrasive powders such as Comet or abrasive scubbing pads. For more Do’s & Don’ts and general granite/quartz countertop maintenance, go to the Care & Cleaning page. Other brands such as Zodiac and Silestone make essentially the same product as a Cambria counter top. They are all quartz countertops made pretty much the same way. Silestone is by far the leader of the market with more distributors, a more efficient production process and more colors to choose from, but the look, feel and function of the product isn't any "better" than the others. 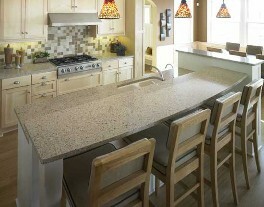 Cost of Cambria countertops is comparable to installing a mid-range granite. One benefit is that all colors are the same price. Expect to pay between $50 - $125 sq. ft. depending on edge detail, cutouts and other variables. All other quartz countertop brands are also in the same ballpark. Deciding which brand to buy will likely come down to color choices and availability from you local fabricator or distributor. Silestone offers more colors but, Cambria countertops offer different colors and unique patterns, so you may want to check out all companies. It's All Marketing. Despite convincing marketing messages by makers of quartz countertops, there isn’t any significant difference regarding performance, function, cleaning or price between granite and Cambria countertops or other brands of quartz countertops. More on Quartz vs. Granite including cleaning and sealing can be found at the countertop comparison page.